While not proved that this record for an Alexander Hond is the present Alexandre de Hond, it seems likely. He was near the proper age and was born in London England; he always said he came from France as a young man. He arrived on the ship Rochambeau, 15 Sep 1913, and the ship's manifest indicated he was headed for St. Louis, MO. He only had $25 in his possession. His nearest relative was his mother (Mrs. Hond), then living in Paris, France. This was his New York City residence until his death. According to the 1930 census, he was not living at this address in 1930 (he has not been found in the 1930 census). He owned the apartment building. He eventually sold the building with the provision that he and his wife could continue to live in their ground floor apartment rent free until their deaths. Alex de Hond was a well regarded as fine chef, and to be invited to a meal cooked on the antique-style stove in the small Brookhaven house was a delight. Most of their provisions were purchased in New York City and carried out by train. He was known for a very fine wine cellar. The de Honds also had an odd little boat which was powered by a small engine (perhaps of one cylinder) that sort of put-put along. They were readily recognizable when leisurely boating on the Great South Bay. Alex was also very energetic, and even when elderly would not hesitate to climb into a tree to trim limbs, or onto the roof to make repairs. When walking down to his boat, which was kept at Squassux Landing a quarter of a mile or so away, he would stride briskly, with his wife Bobbie struggling to keep-up trailing behind him. They are believed not to have had any children. The de Honds did an extensive restoration of the house, returning it close to its original form. It is one of the oldest residences still extant in Brookhaven Hamlet, probably erected shortly after Beaver Dam road was built in 1737. .. the de Honds occupied this cottage as a Summer/weekend home from about 1927 until they moved to the Swezey House at 5 Locust road, Brookhaven. .. now at 5 Locust Road, formerly at 335 Beaver Dam Road. The de Honds resided here as a weekend/Summer home from the mid-1940s until their deaths. This document is the Brookhaven/South Haven Historic Sites datasheet on this site. 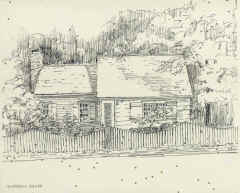 .. now known as the Swezey/De Hond house, it is probably the oldest house still standing in Brookhaven hamlet. .. Perhaps the oldest house still standing in the Hamlet (c. 1738-40), this half-cape with addition (to left) originally stood on Beaver Dam Rd. at what later became the intersection of Locust Rd. It is known to have been occupied by William Egbert Swezey in the mid-19th century. It was moved about 1927 to the next lot up Locust Rd. when Everett Swezey built a new house on the corner lot. This home has Site ID Br32A. 150 bottles of wine went on the block at a public auction. [S426] WWII Draft Registration Cards. [S542] New York Times, 3 May 1989, "Wine Talk". [S6] SS Death Index, SS# 133-16-5418. [S444] Passenger Lists, New York 1820-1957. [S127] Advance, Long Island, 15 April 1927, p. 8..
Mr. and Mrs. de Hond of New York City have rented Water's Edge Cottage on the corner of Beaver Dam Road and Railroad Avenue [Newey Lane] for the season. Mr. de Hond is an interior decorator. It appears as if they lived in this cottage as a summer/weekend residence until they purchased the Swezey house (Historic Sites ID Br 32A) in the mid 1940s. [S53] Personal Knowledge: John Deitz. [S127] Advance, Long Island, 6 November 1928. p. 12. Mr. and Mrs. Alex deHond, formerly of Brookhaven, have taken a house at No. 84 Grove Street, Greenwich Village. [S97] Historic Structure Survey, http://brookhavensouthhaven.org/history/BuildingInventoryForm.asp?InventoryCode=Br32A. [S652] Suffolk County Deed Records, L. 2689, pg. 533; 29 March 1947. Purchased from Dorothy H. Totten. The house was sold by the estate, Janet Henley, executor, August 1989 to Susan Foster, then of Bellport, NY.